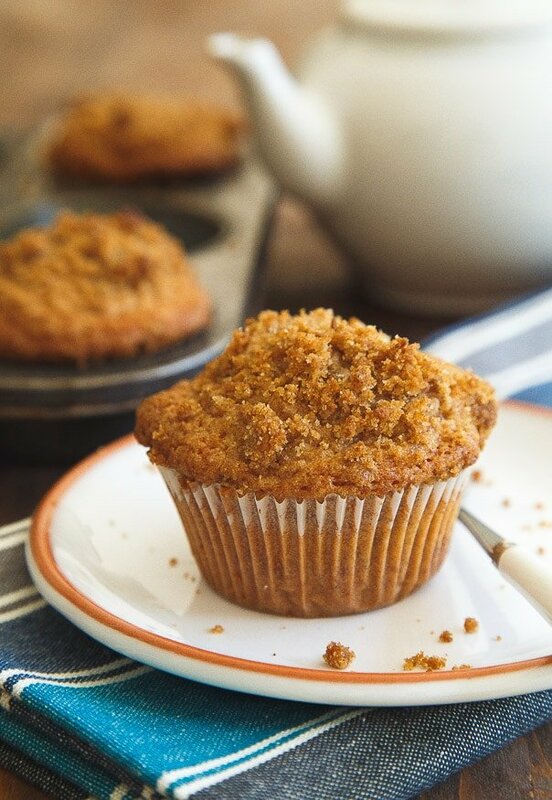 Coffee cake muffins with double the crumbs: in the middle of the muffin and piled on top! I’m going to need a slow clap starting now. When the oven timer goes off, you can begin. When I pull these out of the oven, start to pick up the pace. When I undress a muffin, go ahead and burst wildly into applause. These perfect coffee cake muffins deserve it. My friend Heather requested a small batch of coffee cake, and since she has given me tons of amazing restaurant recs since I’ve been in St. Louis, who am I to deny her the sweet, crumbly coffee cake of her dreams? I debated over making a mini coffee cake in a 6″ pan, but after almost 5 years of blogging, I’ve realized that everyone has a muffin pan, not everyone has a mini 6″ cake pan. If you do own a mini cake pan, welcome to the dessert for two club. I love you. I used my recipe for coconut cupcakes as a starting point for this recipe. If you’ve never made those, you must. Go ahead, I’ll wait. (And whoa, check out that photo quality from a few years ago. Oy). They are dense, like coconut pound cake. I’ve turned coconut haters into coconut lovers with that cupcake! Every time that recipe called for coconut something-or-other, I substituted cream. Heavens. These coffee cake muffins are sinful from the start. 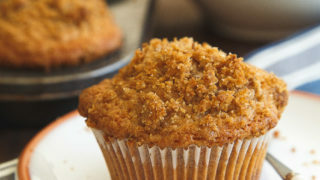 I double up on the crumb topping in this coffee cake muffins, because I’m the boss of my own kitchen. I added crumbs to the middle and the top of the muffin, because a coffee cake without two instances of crumbs is just plain sad. This recipe makes 4 mini coffee cakes, and I know you’ll like them. If you don’t have cream, you may use sour cream. If you want to substitute Greek yogurt instead, that’s fine too, but maybe not fat-free, ok? Muffins need fat for moisture. 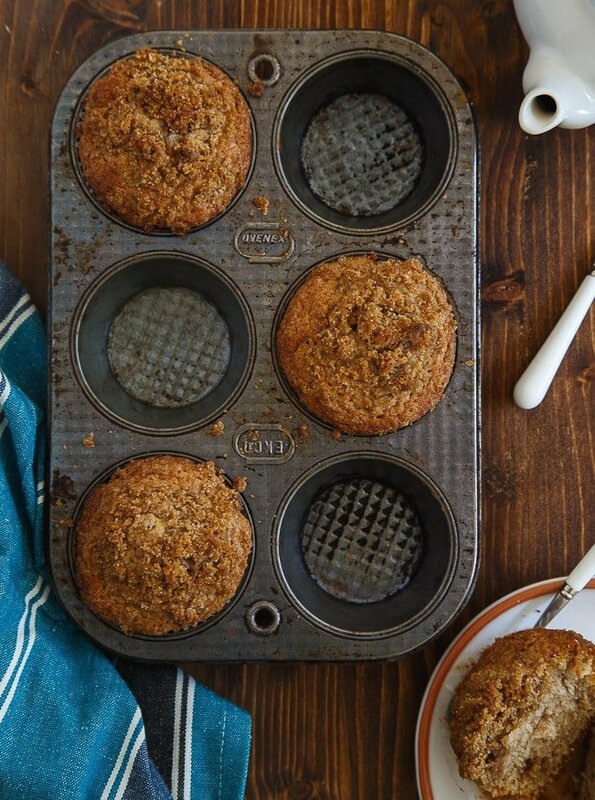 A small batch of coffee cake muffins deserve applause! I have a video for blueberry muffins, and I thought I would share it here because it’s so similar to this recipe for coffee cake muffins. This recipe has fresh blueberries in it, and isn’t the same, but it will give you some general pointers for muffin making. Make both recipes if you’re a total morning muffin fanatic like me! (Sometimes the video pops over to the side bar, so check for it there if you don’t see it above). P.S. If you love crumb topping as much as me, check out these crumb donuts I found in my archives from 2012! I think that was the first time I discovered how to make photo collages. I probably spent hours on that while shoving crumb donuts in my face. It was a very good day, no doubt. I think it’s time to make these again! Preheat the oven to 375, and line 4 cups in a muffin pan with cupcake liners. In a small bowl, make the crumb topping: combine all the ingredients and pinch together to make crumbs. Set aside. Next, in a medium bowl, beat together the oil and sugar with an electric mixer on medium speed for 4 minutes. Next, add the salt, egg, cream, and vanilla and beat for 15 seconds. Sprinkle the remaining dry ingredients on top, and beat just to combine. Scoop 1 1/2 tablespoons of the batter into the muffin cups. Top with a spoonful of crumb topping, and then divide the rest of the batter between all muffin cups. Bake for 19-23 minutes, until a toothpick inserted comes out cleanly, and the crumb topping is nice and golden brown. Coffee cake sooooo reminds me of my mom. She always picked some up from the store when we were having my aunt and other lady friends over for coffee when I was younger. These muffins look amazing!! Hold on now… You mean I can put any of your 4 muffin/cupcake recipes into my 6-inch cake pan?? Seriously, I want to use that pan more often but never knew how to! My dreams are made of crumb toppings. I love this. ok, totally applauding over here.. I have to say, I LOVE the small batch thing you’ve got going on. . love it. And these coffee cake muffins are genius!! and good call on the muffin tin .. I just purchased my first 6″ pan this year! My hubs is OBSESSED with coffee cake.I am pretty sure he talks about it everyday, so THESE crumbly little bites of heaven are exactly what I need to give me best wife ever status. Pinned! A mini coffee cake is definitely my idea of a perfect snack. These sound unreal! These muffins do need a huge round of applause! Love that double crumb action going on in them!!!! I will start the slow clap in 3….2…1! I might share these with the hubs…maybe. Depends on if he brings me flowers! I just might make this ‘breakfast for 1’, if you don’t judge me too much?! Streusel AND a crump topping?! No need to say more, I’m in. Yum! I want one of those for breakfast! You can never, ever go wrong with a crumb topping. these photos are so fab!! it also doesn’t hurt that the muffins look about a hundred times better than the cold cereal I ate for breakfast. 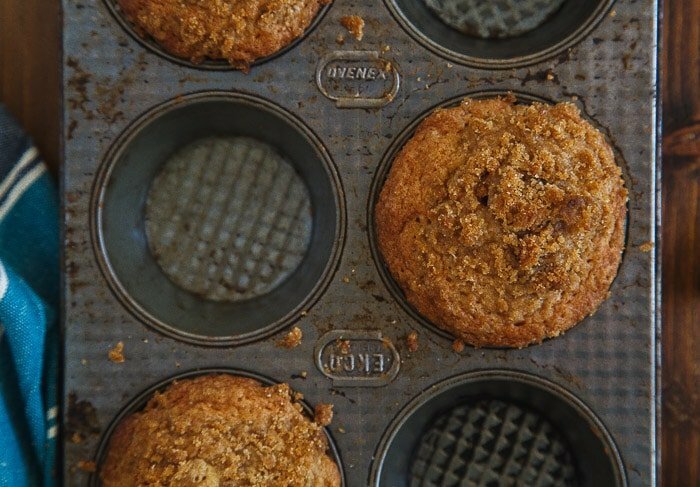 we cannot get enough coffee cake, and in muffin form is SO much more fun! The next batch of muffins I whip up, I’m going to try your heavy cream method. I bet it makes them so moist and delicious! I just love that crumb topping. The more crumbs the better! Is it weird that I don’t have a 6″ cake pan, but I have 4″ cake pans? Bless you for putting crumbs in the middle and on top of these lovely coffee cakes…I’m going to eat them all! These definitely do deserve an applause! And crumb topping for the win! Always! i love small batch idea because honestly, who can stop at just 2 muffins? I love looking back at old photos (not my own of course bc that’s embarrassing), but it’s amazing to see how your mad photo skills have changed over the past few years! The more crumbs, the merrier!! And I love that you went the muffin route instead of the mini cake route. Because, now these are breakfast material. WIN. This recipe definitely makes me think fall is in the air. These sound really good. Looks delicious. I use a 4.5 inch springform pan for my desserts for two. Works great for mini pies and cakes. Any leftover batter I just put in a ramekin. So it’s like dessert for two and a half. So after your immensely helpful presentation at Chopped last week, I’ve been following your blog. This has resulted in a string of things: increased desire to bake carby goodness, lack of willingness to do housework, overwhelming need to read EVERY ONE OF YOUR POSTS. In other news, my husband is a dairy and row crop farmer three hours east of StL, so if you ever get the agronomy bug again or just can’t go another day without bottle feeding a baby calf or want to do a month’s worth of posts on butter, holler out. We’re your people. Oh, yum! The topping is one of the main reasons I like coffee cake desserts so much! I love coffee cake and having a portable version? AMAZING! I had coffee cake once with apples in it and fell in love with it that way. If I added apples to this, would that make the cupcakes too soggy? Should I alter the amount of wet ingredients? Thanks! OH EM GEEE, these just came out of my oven…..absolutely delicious!!!! I followed your directions exactly except: 1) I dont have a mixer (just recently out of college), so I beat by hand, and 2) I used light vanilla yogurt instead of cream or sour cream, just because I had it in my fridge already. Very moist, perfect amount of crumbly topping, didn’t even stick to the muffin liners. Definitely a make-again recipe! thank you so much for sharing!!! is all the crumb topping used in the middle of those things….or will there be enuf to sprinkle on top before they are put into the oven? i am so confused. WOO-HOO!! These turned out great. I used 2% milk and melted butter due to a lack of cream, and they perfectly met my coffee cake cravings without having too many around to tempt me. Thanks! The flavor of these are AMAZING and my husband and I love coffee cake. Note to myself: use a bigger muffin tin next time. I guess I have smaller muffin tins. Still tasted delicious! Just made these and they were the bomb!! So so yummy and delicious, didn’t change a single thing about the recipe except used the sour cream you suggested as an alternative to cream. Yuuuuuum! I made these and they sunk in the middle. I have also made your breAd and it sunk. Please help! I’m sorry :( I saw in a previous comment that you mentioned you live at a high altitude. That definitely affects baking :( I don’t have any tips for high altitude baking, but I follow a blog called Use Real Butter that is exclusively for high-altitude bakers. You could check her tips. Other reasons muffins can sink: not cooked long enough (the raw batter in the middle pulls the top down while cooling) or over-beating (which puts too much air in the batter that deflates during cooling). I wonder if whole milk buttermilk will work. Just wanted to say I’ve been making these often! My fellas love them and I pretty much need to double the batch from here on (like I did yesterday…) because my son can’t get enough! Thank you – these bake up so beautifully (in my experiences, they dome so nicely) – they smell divine, they taste amazing – pretty much doesn’t get better. I might try it in a cake/baking pan one of these days. Thanks, Christina!! Made these for Christmas morning in lieu of my family’s traditional huge coffee cake. They were delicious and honestly tasted pretty close to the recipe we usually make. I didn’t want a ton of leftovers though so this was a perfect solution. Thanks Christina! Your recipes are wonderful. Your photos alone sold me on this recipe—I tripled it to make a full dozen for family brunch. I think the silence of everyone chewing was the applause. Delicious! The crumb topping in the middle was my favorite part. another success in making one of your recipes gluten free by using Bob’s Red Mill 1 to 1 Baking Flour – using small batch recipes in my gluten free baking experiments allows for less waste if it doesn’t quite go well and less temptations hanging around the house! I added some fresh blueberries to these and they were fantastic! Thank you! !